"If you can't stand the heat, get out of the kitchen," the saying goes. And after reading Michael Gibney's Sous Chef, I would have to say my respect for those who cook our fine restaurant food is sky high. If I ever think otherwise, please remind me that I do not have what it takes to work the line. Not the passion, the perfectionism, the rough edges, or the grace. 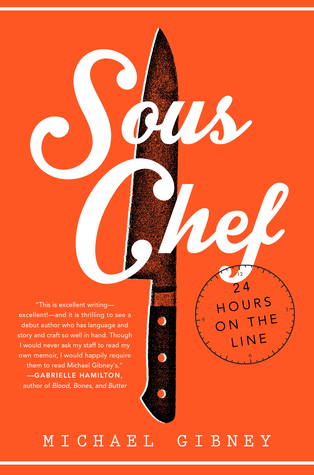 Sous Chef is not a memoir, per se. It's a fictionalized account of a day in "your" life as the chief lieutenant of a famed chef at a busy New York restaurant. And by "you," I mean "you." Gibney writes the thing in the second person. As in, "On Fridays you get in about 0900." While weird at first, this stylistic choice pays off big time as the fictional day progresses, the pressure mounts, and you you YOU feel like you just might fail fail FAIL. While no environment is free of accident and human error, the ability to work collision-free is expected of any good cook. In good restaurants, everyone works this way, with sprezzatura: a certain nonchalance that makes their actions appear to be without effort and almost without thought, an easy facility in accomplishing arduous tasks that conceals the conscious exertion that went into them...There are no burns or cuts, no pans dropped, no spills or messes made. Its practitioners call this performance "the dance." Nor is Sous Chef into restaurant muckraking. The high-end restaurant portrayed uses only the best ingredients and adheres religiously not only to health code standards, but even more so to epicurean standards. Stations are spotless. Food is fresh and well-stored and well-treated because such food just tastes better. I found myself highlighting passages that would make me a better cook and Market shopper. For example, Gibney recommends that "whole fishes must be sitting upright in the ice...in order to preserve their anatomical constitution...Portioned fishes, on the other hand, must be wrapped tightly with food-service film, laid out flat and even in perforated trays (which keep liquids from pooling) and overspread with ice." Keep your fridge set below 40F because the main pathogens have difficulty thriving at the temperature. Keep industry-raised chicken below and separate from all other foods. "...The Department of Health considers the bird a terribly dangerous creature. It marinates in its own filth from the time it dies until the time you put it in the oven. It is a haven for bacteria. And its exudate--chicken juice--travels like quicksilver. No other protein can cross-contaminate its neighbors quite like chicken." Yikes. Mussels should be tightly closed and, if in cold water, they should float, indicating they're still airtight and alive. The book should have widespread appeal, to foodies, fans of cooking shows, home cooks, and discerning shoppers and eaters. I recommend!